Arnold Franz Walter Schoenberg [originally Schönberg] (13 September 1874 – 13 July 1951) was an Austrian and later American composer. Many of Schoenberg's works are associated with the expressionist movements in early 20th-century German poetry and art, and he was among the first composers to embrace atonal motivic development. Bars 5 - 7 from Schoenberg's Kammersymphonie Opus 9. Market value is irrelevant to intrinsic value. … Unqualified judgment can at most claim to decide the market-value — a value that can be in inverse proportion to the intrinsic value. I have just read your book [On the Spiritual in Art] from cover to cover, and I will read it once more. I find it pleasing to an extraordinary degree, because we agree on nearly all of the main issues..
Now we will throw these mediocre kitsch-mongers into slavery, and teach them to venerate the German spirit and to worship the German God. Hauer looks for laws. Good. But he looks for them where he will not find them. I see the work as a whole first. Then I compose the details. In working out, I always lose something. This cannot be avoided. There is always some loss when we materialize. But there is compensating gain in vitality. ...if it is art, it is not for all, and if it is for all, it is not art. My music is not lovely. Quoted by Theodor Adorno in his essay "Art and the Arts", 1966, reproduced in Clausen 2008, 387). Stuckenschmidt, Hans Heinz. 1977, in Schoenberg: His Life, World and Work; translated from the German by Humphrey Searle. p. 349. I was never revolutionary. The only revolutionary in our time was Strauss!" I am delighted to add another unplayable work to the repertoire. In your works, you have realized what I, albeit in uncertain form, have so greatly longed for in music. The independent progress through their own destinies, the independent life of the individual voices in your compositions, is exactly what I am trying to find in my painting. [Schonberg's] music leads us into a realm where musical experience is a matter not of the ear but of the soul alone, and at this point the music of the future begins. Schoenberg, in a letter to an unknown correspondent, Berlin, 22 April 1914. It is in fact not clear whether Strauss really wrote this. Alma Mahler was a highly unreliable source when it came to what Strauss wrote in letters to her. Strauss was always highly supportive to Schoenberg, even though their musical philosophies were so different. 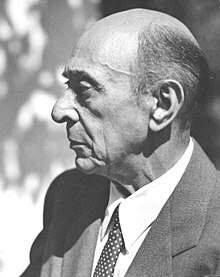 In fact, the influence of Schoenberg may be overwhelming on his followers, but the significance of his art is to be identified with influences of a more subtle kind - not the system, but the aesthetic, of his art. I am quite conscious of the fact that my Chansons madécasses are in no way Schoenbergian, but I do not know whether I ever should have been able to write them had Schoenberg never written. This page was last edited on 20 February 2019, at 10:50.